It's full steam ahead for the Milkhare animation project this month. Numerous potential locations across the South-East of England were recce'd in February for the 3D stop-motion sequences, with further visits planned this week. 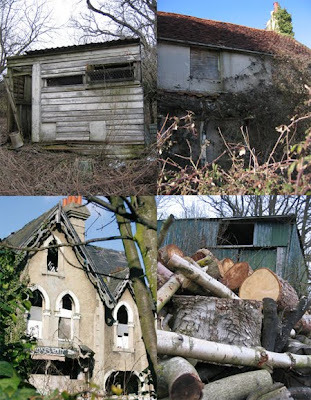 Not sure we've found 'the one' yet, but we've seen some beautiful decaying buildings and other derelict treasures. Hopefully the perfect location will be discovered before Spring teases the leaves back onto the trees, so please, please get in touch if you know of a crumbling cottage near you. Audio and props lists are also complete and are being circulated. As selected audio and video footage will be released online under a Creative Commons licence, the aim is to capture as much original audio footage as possible, rather than using royalty-free audio clips, so that White Rabbit Animation can distribute even more dark 'n' delicious AV goodies to anyone interested in using them in their own non-commercial, creative projects. Last, a child actress has been secured for the narrator voice-over. I'm trying to organise some time in a recording studio or similar facility for this (fingers-crossed) and will post the final soundtrack on MiLK HaRE and the White Rabbit blog later this month – so watch this space! Have an extra lucky month, and if you do nothing else, treat yourself to a bit of Burton at your local cinema – it's going to be WONDERFUL!